UBC Camps works hard to provide an accommodating and inclusive camp experience. 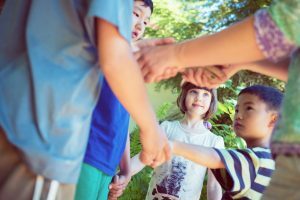 By giving us additional information about your child prior to camp beginning, we can work together to ensure your child has a positive camp experience. While the information you choose to share through our online form is confidential, it will be shared among camp management and the instructor working directly with your child. We encourage you to provide as much detail as possible; this will allow us to educate our instructors, who can in turn modify programming to better accommodate and ensure all campers are included. The information you provide will also allow staff to better address conflict, should it arise, and to better understand behaviours as they arise. Information you may wish to share could include tips and tricks for calming your child down or helping them to focus, a medical diagnosis, recent life events that may affect your child’s wellbeing at camp, your child’s likes/dislikes, colour or light sensitivities, and more. Note: UBC Camps is not able to provide 1-on-1 support for campers at this time; the information you provide is meant to ensure instructors are knowledgeable prior to the first day of camp and can plan accordingly. If your child requires 1-on-1 support, and you are able to have a family member, friend, support-worker, or aide attend with your child, in most cases we are able to accommodate this request. In which case, please communicate with camp administration early. Click here to complete our online Exceptionalities and Behaviour Form. If you have any questions, or require additional information, please contact us by email at ubc.camps@ubc.ca or by phone at 604-822-1540.